There were at least two different styles of bunkbeds used in the HiLander model. This page documents the style used in the earlier models. 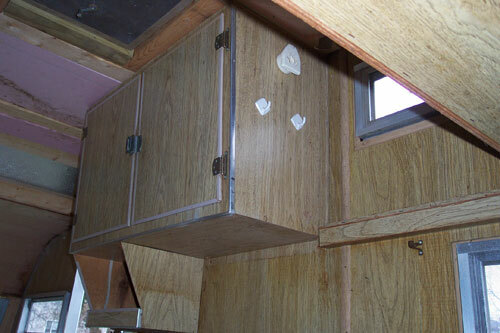 Later (late 70s on) used a model that was cabinets until/unless you pulled them out to be used as a bunkbed - that style will be documented later. If you have anything to add, please e-mail me. Pictures and information courtesy Eric Keiffer (thanks Eric!). worked like the lower Gaucho bed. 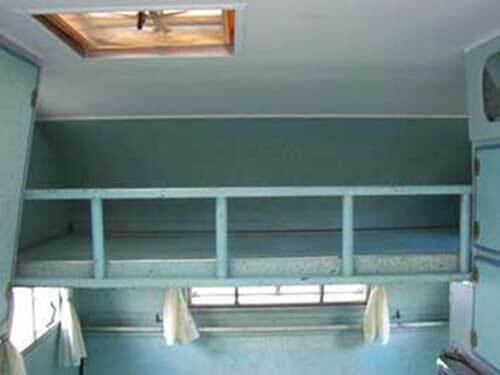 Over the years, many of the HiLander models have lost the original ladder for their top bunk. 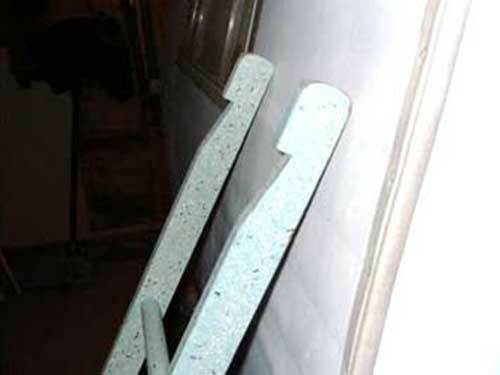 This very useful item could also be used as a railing to keep those little ones from falling out of that top bunk. Many thanks to Brian and Wayne for taking the measurements, sending the pics, and offering these suggestions for making your own ladder. If you have anything to add, please e-mail me. There is a difference in the measurements of Brian and Wayne's ladders. Wayne's side rails are only 3/4" thick, while Brian's are 1 1/4" thick. I would use Brian's for a sturdier ladder. Brian's ladder though is only 9 3/4" wide, while Wayne's is 11" wide. Seems like the 11" wide ladder would be more practical. So those are the measurements being given below. Simply noting the difference here--use what will work for you. Legs have a 12 degree angle, with the long point on the opposite side of the notch. To make the notch which hooks on to the side of the bunk, measure down 2 1/2" and make a pencil mark, then measure to 6" amd make another mark. Then from the 2 1/2" mark draw an angle of 12 degrees. The angle is 1/2" to 5/8" deep. After you mark your angle, connect the 6" mark to the inside depth of the 12 degree angle. HiLander ladder in use. 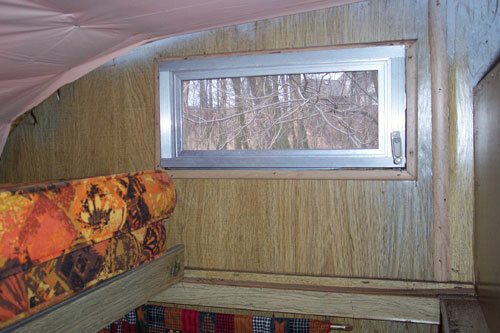 Note that the notch fits over the edge of the bunk. 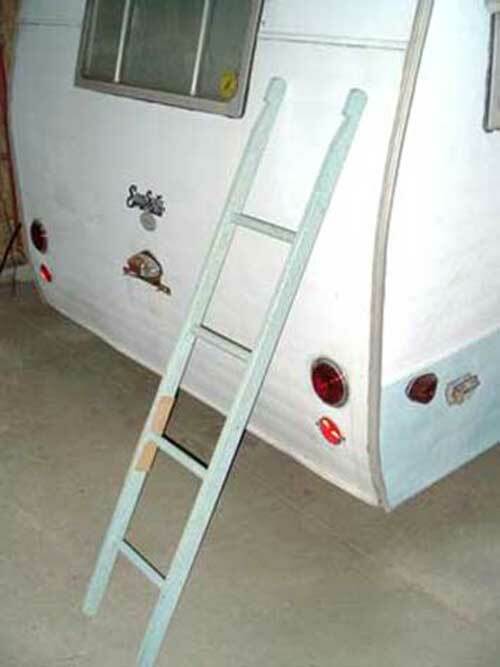 Ladder shown by itself--backwards so you can see the notch. A closeup of the notch. 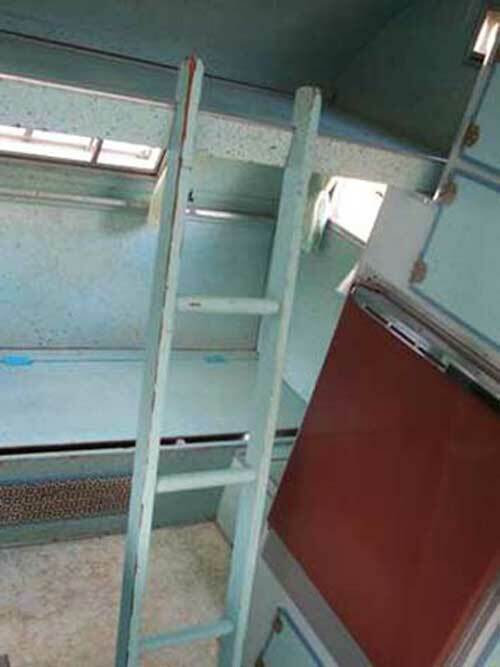 Ladder in use as a safety railing.